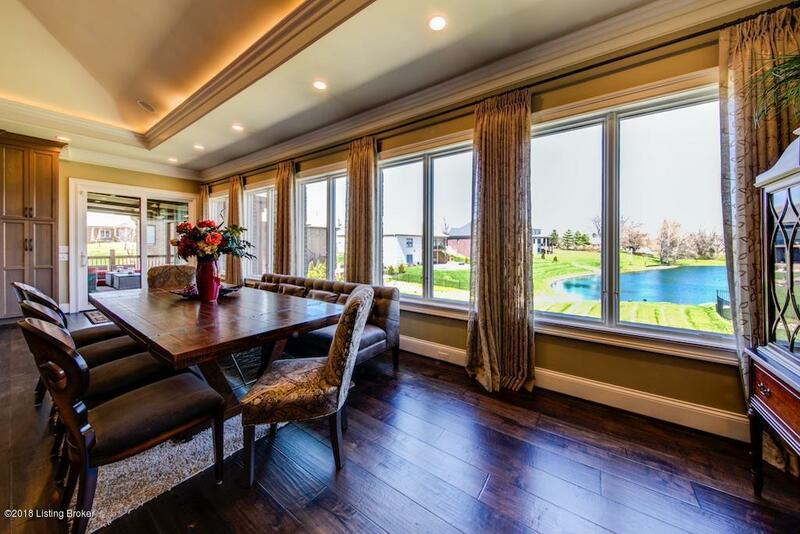 NEW PRICE**Amazing Homearama 2015 Home, Stunning Unobstructed Lake Views, Luxurious, Open, Spacious, Gourmet Kitchen, Media Room, Hot Tub and Outdoor Fireplace (be sure to see the pictures)! This English Tudor inspired brick and stone ranch offers 4,787 square feet of well-appointed living space. 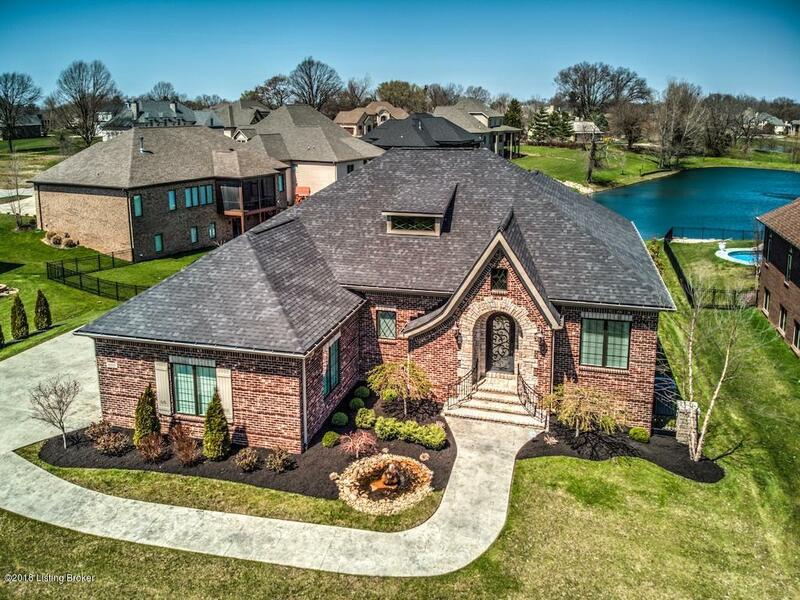 From the front swooped portico and wrought iron decorative door to the back patio overlooking the lake this home will thrill you with its views, architecture and amenities. 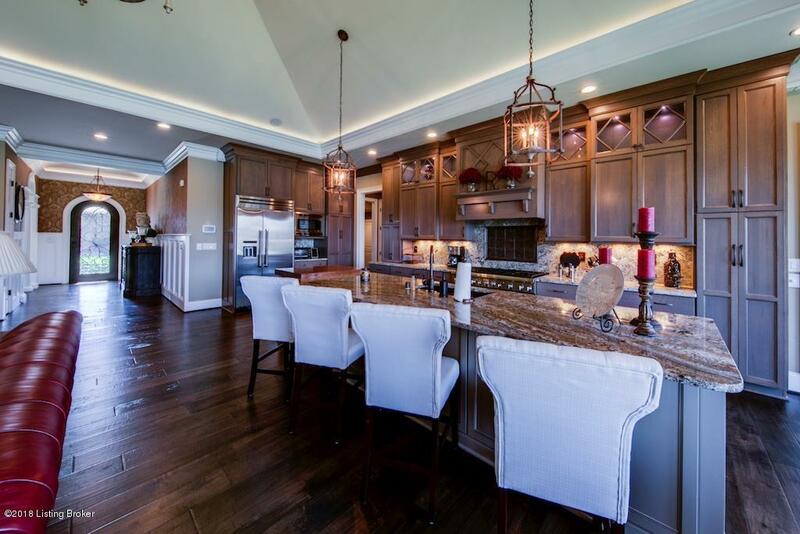 Walk into a formal entry and into a wide-open Gourmet Kitchen, Dining area and Great Room. The home was designed to maximize lake views with walls of windows. The Kitchen comes complete with custom cabinetry, Thermador high end appliances including a double oven/gas cook top and custom cabinetry a(for a culinary experiencesecond to none) and a large center island. Off the Kitchen access to the deck with a State-of-the-art motorized sun screen allowing outdoor living on both cloudy and sunny days. The 1st floor Master Suite will thrill you with a master bath featuring a large 2-person shower and separate free-standing tub and his and hers vanities. The large walk in closet offers California closet style shelving and its own center island. The Master Closet has direct access to the laundry room and can be closed off from the rest of the house. You'll also find another bedroom, full bath, bath and office on the 1st floor. The walkout lower level is a dream come true for anyone who likes to entertain. 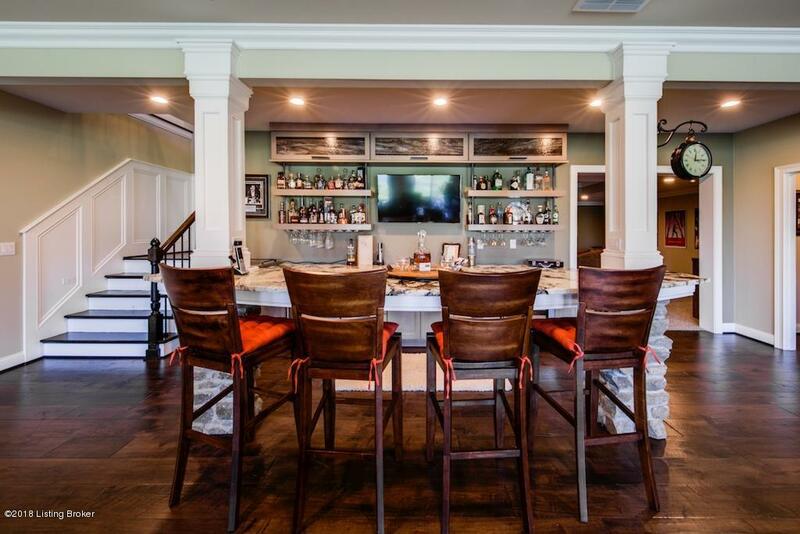 You'll enjoy a large Family Room wide open to an enormous wet bar and game area. You can stand in one section of the room and watch 4 Flat Screens at once including the projection screen in the theater room. There are 2 other bedrooms and bath on this level as well. Out back a patio and outdoor fireplace for cozy get together and enjoy views of the lake. Don't miss the 3 car garage with epoxy floor and hot and cold water hookups. Features include: central security system with remote access, cameras, and automatic indoor/outdoor lighting (4 outdoor cameras and 4 outdoor speakers), Custom painted and sealed garage floor, Dual stage high efficiency HVAC system, Full landscape service pre-paid for 2018, HOA fees paid for 2018, Indoor/Outdoor Surround sound on each level, Ten (10) Televisions to stay with home, Television in garage with surround sound, Theater/media room with 120 inch projection screen and equipment, Thermador Professional Series Appliances, Front entrance outdoor water feature, Central vacuum system, Centrally located laundry room accessible from master suite, Washer and dryer included, Custom trim and Crown Molding, Exceptional open floor plan-excellent entertaining home, Custom granite countertops throughout home, Custom free standing granite bar downstairs, Green building insulation package and LED lighting, Hot tub, Irrigation system, Outdoor BBQ equipped with sink and refrigerator, Outdoor living area with fireplace overlooking water, Pella designer window wall for lake views, Pet free home, Smart home system and Honeywell Home Control Center , Two fully covered patios- private master bedroom direct access, Vaulted ceilings with custom faux paint ,Wide-planked hardwood flooring, Wrought iron front door, Large kitchen island with butcher block table area, Pocket office off garage entrance with eCharging station/built-in desk/storage, Spectacular master walk-in closet with granite center island/storage, Lower level Linear fireplace with custom stone. If you have read all this, you really need to see the home in person. Much of the furniture will be available for purchase.